This is another one of those spur of the moment recipes that happened by chance. I needed to come up with a side dish to bring to our huge family July 4th party and I was looking for something new. I was tired of the standard coleslaws and pasta salads so I just kept searching and searching. Nothing was screaming out at me though. Do you know what kept popping into my head? My Mediterranean Quinoa Stuffed Avocado. It's like it kept creeping in there with a purpose. So I finally gave it and looked at it. Why not turn it into a salad! It was new and exciting and it didn't have that heavy mayo base that I try to avoid sometimes. Not that a mayo-based salad isn't good, it's just not my favorite. And this one was very light and perfect for a hot summer day. I think it will become my go-to side dish for awhile. I haven't found anyone that didn't like it so I think it's a keeper! I left out the avocado in the salad version, but you could easily chop up a couple avocados and toss them with everything else. 1. Cook quinoa according to package directions: Rinse quinoa (most come pre-rinsed but I find it cooks better if I rinse again) and place in a saucepan with water. Bring to a boil then cover and reduce heat. Simmer for 15 minutes. Turn off heat and let sit for 5 minutes untouched. After 5 minutes, remove lid, fluff with a fork, transfer to a large bowl, and allow to cool completely. 2. 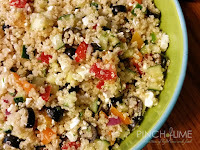 Add cucumber, feta, tomatoes, onion, and olives to quinoa. 3. 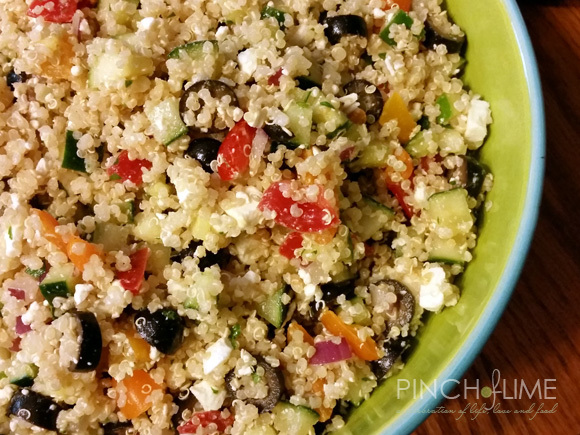 Combine oil, lemon juice, vinegar, and salt together and toss with quinoa. Serve immediately or chill until ready to serve.